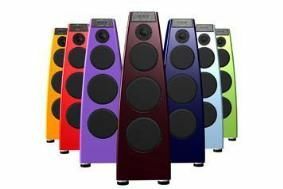 Meridian offers bespoke colours for its hi-fi and AV range | What Hi-Fi? The company is now offering a bespoke colour service, Meridian Select, on some of its products. Customers can choose from a wide selection of colours using the RAL Classic system, the European colour reference standard. Meridian Select is available on all the firm's lacquered DSP speakers; the SW1600 and SW5500 subwoofers; and all 800 Series electronics, including the 808.3 CD player, 800 DVD player and the 861 surround controller. As well as bespoke colour lacquering, Meridian Select includes further personalisation in the form of a small plaque with the customer's name alongside the signatures of Meridian's founders, Bob Stuart and Allen Boothroyd. Production time for the bespoke colour option is six weeks, and Meridian Select products will cost on average 15 per cent more than the standard models. This means a pair of Meridian Select DSP speakers start from £7763, subwoofers from £2645 and 800 Series components from £8625.